Welcome to the Abusive Relationship Awareness Blog Hop. You should have arrived here from Pam's blog. If you are just joining us and want to start from the beginning, please start at Ashley's blog. While this may not be your typical blog hop theme. We decided to put together this hop in order to shed light on a topic that often goes unspoken about, when the truth is many of us have either been in an abusive relationship or know of someone who has. We're here not to celebrate abusive relationships, but to bring hope to those who have been firsthand or secondhand victims and to provide awareness to help put an end to this growing problem. No one should ever have to find themselves in an abusive relationship. When you care about someone, you treat them with love, kindness, and respect. For my project, I turned to one of my favorite Bible scriptures : 1 Corinthians 13:4. It can not be easily angered. never stops trusting, never loses hope, never quits. Can you just imagine how different the world would be if everyone abided by these rules? I knew I wanted to include these words on my project. I created a card with using purple cardstock as the base with some pretty floral patterned paper with purple in it. I sometimes like to turn to printables for my projects because they sure help to make the job easier! There are so many sources of wonderful free printables out there, too. For this project, I used a subway art printable from The Girl Creative. I am loving subway art right now because I'm kind of a font freak, and I love how subway art incorporates so many different types. I printed this out on white cardstock and then matted with the same purple cardstock that I used for the base. I added some flowers and then some bling to the flower centers. To help promote awareness for abusive relationships, eleven sponsors have been kind enough to offer almost $200 worth of prizes to those who participate in the blog hop. Yes, you read that correctly, there will be 11 PRIZE WINNERS. For a complete list of the sponsors, please visit Ashley's blog for full details. Winners will be randomly chosen and announced on http://especiallymade.blogspot.com/">Made Especially For You on Friday May 20th. Comments after Thursday May 19th will NOT be eligible to win any of the prizes. Very pretty and bright, perfect sentiment for this theme. How beautiful you have made the framed saying. This is beautiful!! I love this scripture!! Oh I love this! What a great reminder of what love is! BEAUTIFUL!! Beautiful - I love the subway art, the floral mat, and the dark purple! Very nice card. Thanks 4 sharing. I'm a new follower. Thank you for providing the link to the subway art, its a great look and I am happy to see there are MORE!! Thanks so much for inspiring me with that lovely matted script! Thanks for taking time to bring an awareness hop to the net! Wow, love that sentiment and your cherrfully bright card. Thanks for letting us know where to go for it. I still haven' learned to use the PC for sentiment printouts. I have truly loved all the designs on this hop...and the inspiration is beyond amazing but this is definitely on of my faves!! WONDERFUL!! 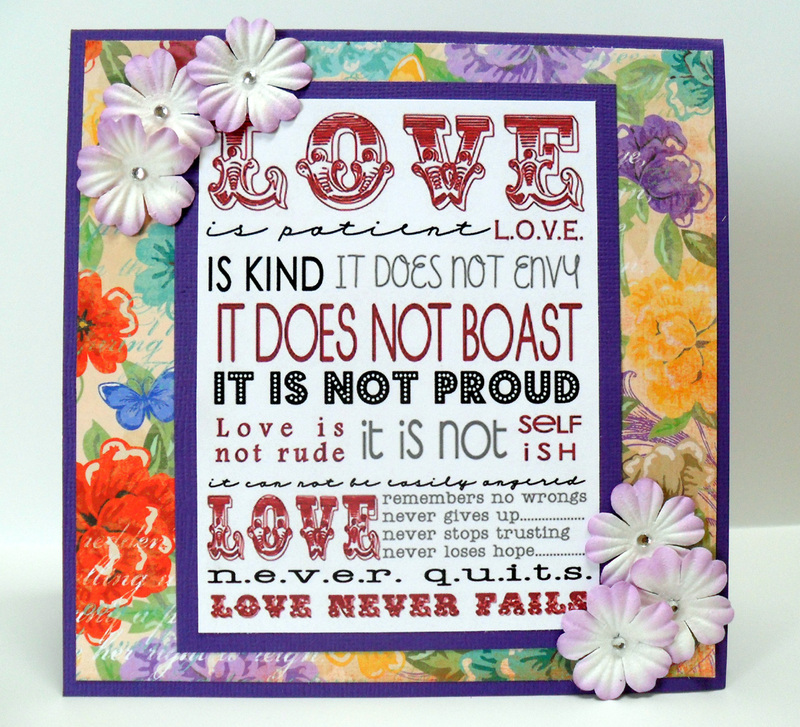 Lovely card and something we too often forget- what love really is as opposed to what it is not. I LOVE YOUR CARD!! That is my favorite bible verse. Thanks so much for sharing this creation! What a beautiful card with such a significant message! Thanks for the chance to hop for such an important cause. I love it! So perfect to help someone who needs it! very beautiful project! love the subway art and I must make one for our house and great for a gift too. lovely card, and such a worthy cause for a hop! love the subway art! awesome! I love your project. That is my favorite bible verse. I am a new follower and glad that I found you on this hop! Beautiful card portraying such a wonderful message. Thank you for the inspiration. Love the card and the subway art on it is awesome! very pretty, dena! love the bold sentiment with the delicate flowers. well done! Yes the word would be a different place if everyone lived by those rules. Beautiful sentiment. Thanks for helping to increase awareness. Your card is so pretty! I love how the sentiment turned out. :) Thanks for participating in the hop!